Speedy and I decided to catch up after work over a bowl of ramen and headed down towards Izakaya and Ramen Village (a.k.a Denman & Robson in the West End). Due to long lines at our 1stand 2nd choices, we decided to eat at Motomachi Shokudo. Neither Speedy or I were concerned about the food we were about to eat. In order to compete in Ramen Village, you need to serve a good quality bowl of noodles. The consequence of average ramen in these parts is banishment; R.I.P. Benkei Ramen. We decided to share an order of Kimchi and Gyoza. 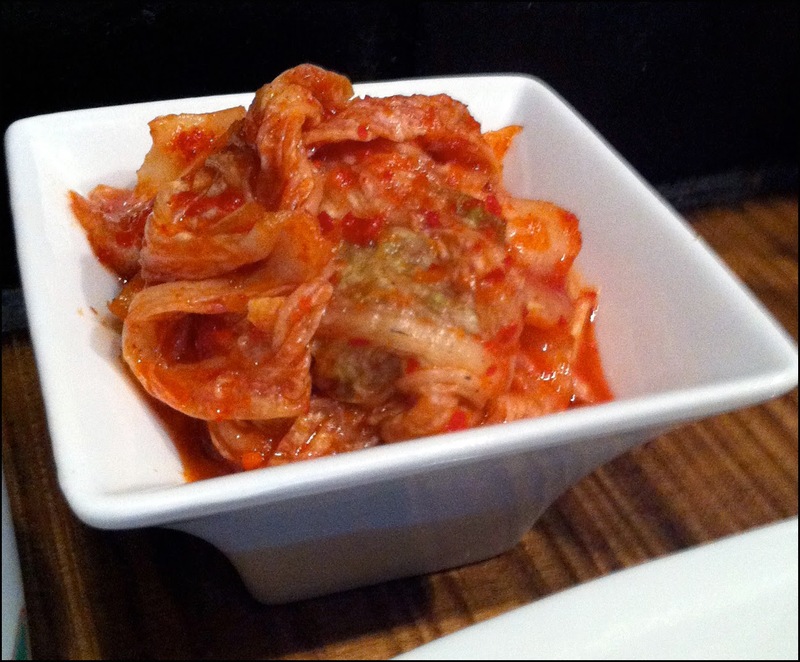 The Napa cabbage (Sui Choy) Kimchi was crisp, sweetish and not very spicy. Towards the bottom of the dish, the flavor decidedly took a very garlicky turn. I’m sure I would have killed Dracula if I had a conversation with him after eating the last bits of this veggie side dish. In terms of the gyoza, we ordered it to make sure we would be full. 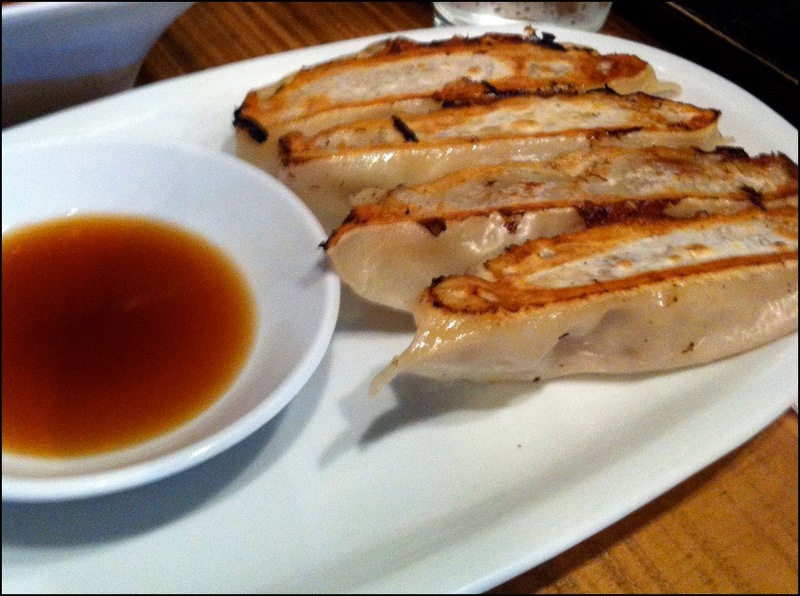 From my experience, most gyoza served at ramen places are not really unique, forgettable and serve as filler (like we were doing). I will have to admit the butchigiri gyozas served at Motomachi Shokudo are definitely not just filler. As for the filling, it was juicy and seasoned well. I found these gyozas tasty and notable in a good way. 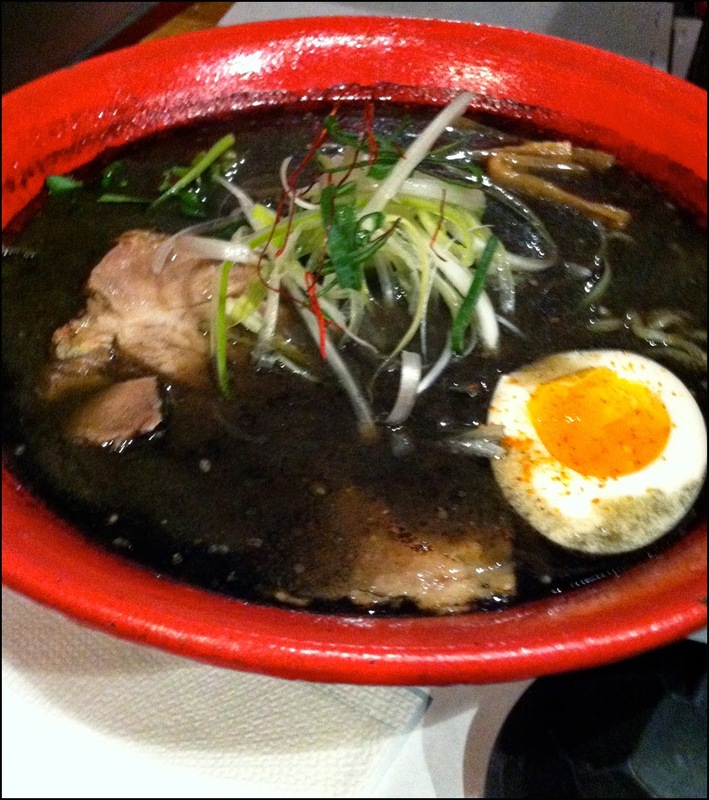 The most unique noodle item on the menu is their black charcoal ramen. On the menu it touts charcoal’s medical benefits of aiding with digestion. I’m always skeptical of health claims and after doing a bit a research I’m not sure how helpful charcoal is to one’s health. The soup looked like watered down black sesame paste to me. Smelt like regular ramen and to be honest tasted like a shio soup base except for a slight hint of a charcoal aftertaste. I guess the darkness of the soup tricked me into thinking that the charcoal taste would be stronger. Upon reflection, I guess no one wants to eat charcoal so I feel Motomochi deftly balanced the flavour of the soup base and the charcoal. Unfortunately, besides the novelty of the pitch black soup and that fact I have now ingested charcoal without having to visit an ER, the bowl was solid but unspectacular. The noodles, semi-soft egg, pork slices and veggies toppings were good but the whole ensemble didn’t have the wow factor for me. None of the flavours or any components in the ramen dish were impactful enough to grabbed my undivided attention. After my visit to Motomachi Shokudo, it confirms its place as my 3rd favourite Ramen eatery in Ramen Village behind Santouka and Marutama. However, I would return to Motomochi for the butchigiri gyoza and perhaps I would have it with a side of ramen.